Your post just transported me to my childhood, darling! #HUGSSSS I smiled all the way! Thank you for reading me today! I am one of those weird morning people. I function best between 4 am to 10 am and after 9.30 pm all my faculties shut down one by one. Ask me a question post dinner and in all probability you will simply get a mumbled sleepy response. Thank God I never stayed in a hostel for I would have simply missed all the post dinner fun ! I am a morning person all over again, Ruch. I will not say I am totally unaware of your 'slow faculties' past 9:30 pm, but I will say, yes, you do sleep earlier than most. Lucky you is what I will say! If you were in a hostel, you would have changed. No choice in the matter there, usually! I guess all mums are alike. Though my mum was not a morning person, she did try to persuade us to wake up early. Alas, no one paid any attention. Me and my brother were night birds. It runs in the family. And if your brother is like mine, he is unlikely to read this. Sometimes I want to shake mine and force him to read my blog. We must figure out a way of shaking our brothers to read us, Alka. Lets, please! I am a confirmed night owl ,being forced to change by a weird morning person called my husband. Good to see you here, Mridula. I am a morning person. I love to wake up early. But that was not the case when my mum used to drag me out of my bed to study. Now that I don't have to study, just type my way to glory, it is bliss. And do brothers ever read the blogs? I say neverrrrr. Our brothers need to be taught ... how to read us. How, Jas, how? You took me down the nostalgic lane. My parents too took this early morning studying seriously and my mom would be on me at 5 AM. After a few failed protests, I took the same route as you guys. I used to lean on my study table in an angle that my mom can't directly see my eyes without me knowing. And then snooze..... But the ears would be very attentive for any noise to maintain the pretense in time. Ahhhh... those days! I swear to god that I didn't even read one worthy word in those wee hours that my mom could have let me sleep till 7 as well. Ha ha ha ha, your memories made me laugh. Thanks for sharing them, Vishal. 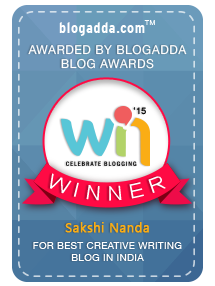 Sakshi first, thank you so much for stopping by at my blog. Now this made me smile all the way through. yess...yeah just that...haan aisa hee...the mind kept telling and the head nodding in approval. Finally the torch that Ma had...it's in our hands now...and as years pass you shall see...feel and know. By God. Looks like poor Nishad has his work cut out trying to find sly ways to catch a quick snooze at 5.15. After all, his mommy already knows each one that exists! I have always been a night owl. I don't know how I managed to get up at 6:00 during school, but have never attended the first lecture in college which was at 8:00 in the morning. I am an nocturnal being and love the sound of the night . But as years pile on my grey strands , I realize that my body and mind is not agile as before to perform the gymnastics with the needles of the clock and prefer to retire to bed early. Being an early riser has many plus points but , but.........old habits die hard and it requires my son's college (early morns) timings to pull me out of my bed. Why doesn't the Sun oversleep? "Gymnastics with the needle of the clock" - That's creative, Kalpana. As for the Sun over-sleeping, sigh! I so wish too. I know, through 365, that you are an early riser. Quite early, actually. Thanks for reading this, Reks! My brother and I were put through the same ordeal by our mother. We always took turns to sleep while the other kept watch. Haha! :D Amen to that, Brendan! I used to be a night person when I was a student. Staying up late to study, sometimes the study times stretching way into the early morning hours. Mom and dad always woke up early but it was our duty to get up, put an alarm or wake up. Strange as it sounds, they never woke us up. Now, I have to wake up by 6. Have to send two kids off to school :). Even if I try to, I can't sleep till very late. Thanks a lot for stopping by, Deeps. "Book Haunter" would make a great title for a post. Sreeja, waiting for one from your pen!! loved it! This perfectly describes my current situation! My mum starts waking me up everyday at 5 so that I end up waking at 6 to study! The hours of sleep that our mothers sacrifice for us in such small small ways often goes unnoticed! I do agree with the sacrifice bit. They have no personal incentive but to make us get up and pull up those socks. If only we understood these things on ground zero. Realisations often take quite a lot of time to arrive. Mostly, when you are a mother yourself. Thanks a lot for spending time reading this, Ketakee.